Already by 1945 the British Air Ministry had started analysis of the effectiveness of RAF war-time camouflage, with the conclusion that use of all schemes (except for the night fighter one) should be dropped after the war. In 1947 a change to a Silver overall finish was ordered. The UK-based Day Fighter Scheme of Dark Green and Dark Sea Grey over Silver was re-introduced in mid-1950s (in continental Europe PRU Blue was used on undersides). Light Aircraft Grey replaced Silver from 1966, phased out in 1970s with switch to wraparound scheme. It remained in use until the late-1970s (effectively 1980s) when the grey schemes were introduced. 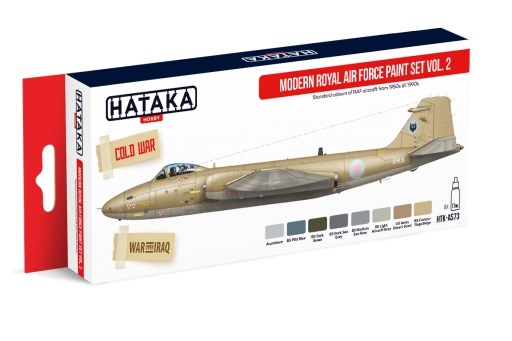 HTK-AS73 includes standard colours of RAF aircraft from 1950s till 1990s.